In the middle eighties, Spain decided to accept the offer of Northrop, an USA company, to supply the F-18 fighter to the Spanish Air Force. In the agreement the need for partially compensating this acquisition with investments and American purchases in Spain was incorporated. So, Northrop began, through an office in California, to look for investors with some interest in Spanish equipment and found that Palm Beach Cruises, a cruise branch of the Grundstad Maritime Overseas group, needed to construct a cruise ship to expand their Florida operations. A building contract with Unión Naval de Levante, valued at $57 millions, was signed on July 25, 1987. This document provided the shipyard with around 800.000 man-hours of work, and was their first incursion into the then booming international construction market of cruise ships. Later, on December 14 1989 another contract was signed between Unión Naval de Levante and the Scandinavian owner EffJohn International to construct two cruise ships, with an option for a third. Effjohn International was the resulting company of the merger of two old Scandinavian owners, Swedish Johnson Line, and Finnish Finland Steamship Co., (EFFOA), which took place in May 1990. The construction contract was effective in March 1990, delivery date of the first ship being summer 1992, while the second would follow her a year later. In July 1991, Commodore Cruise Line, an EffJohn branch, bought the registered trademark "Crown Cruise Line" from Grundstad Maritime, with the purpose of operating the two ships then in construction in Valencia under this house flag. Commodore also bought half of the shares of the other assets of Crown, including the new Crown Monarch. The intention then was to operate the trio of Spanish built ships from Palm Beach under the Crown Cruise Line flag. Firstly, it was foreseen that the first ship of the larger duo, the Crown Jewel, would be delivered in May 1992. However, she was delivered to EffJohn International on July 20, under Panamanian register. After a brief call in Barcelona to show her at the Olympic Games, her first cruise, a transatlantic trip to New York, begun in that Spanish port in late August. Later, she sailed from New York to New England and Canada, called "Fall Foliage". On December 6, 1992, she began her first cruise to the Caribbean from West Palm Beach. The second sister, the Crown Dynasty was delivered (after a fire in the shipyard) in March 1993. She was christened in New York by Betty Ford on the July 16th and begun her first cruise the next day. But the business of the American affiliates of EffJohn begun to enter into the red and her Scandinavian owners sought to upgrade the operation. So, on January 1993, Cunard and Crown Cruise Line entered into a ten-year agreement to operate both sister ships (and the Crown Monarch) under the Cunard Crown Cruise flag. In 1994, Effjohn International had losses of $30 millions. It was the logical result of a combination of factors, among them the sinking of the Estonia in September 1994, which provoked a passenger traffic slump in the Baltic (the principal source of earnings of the group), and the lower value of the Swedish crown with respect to the Finnish mark. As consequence, in late 1994, EffJohn decided to concentrate their activities in their core business: the Baltic ferry market. In the first months of 1995, the situation was even worse, with losses $15,5 millions in the eight first months. But, this time the reason was the sale, with serious losses, of the Effjohn North American cruise operation. In only ten months, EffJohn ceased to directly operate cruise ships. Thus, in December 1994 the Crown Dynasty was bare boat chartered to Cunard, and the Crown Jewel was sold to Star Cruises. In mid-July 1995, EffJhon also sold Commodore Cruise Line and their ageing cruise ships to a group of American investors, and in October chartered the Leeward to NCL and the Crown Monarch to a Far East gaming operator. The latter sailed first as Nautican from Singapore, and presently as Walrus from Hong Kong. Later in 2004 it was rumoured that she was purchased by Club Cruises, a Dutch owner, who later chartered her to the British tour operator, TravelScope, but this scheme wasn't confirmed. Also, EffJohn itself changed his name to Silja OY in September 1995. The Crown Jewel was a true bargain for Star Cruises, because her purchase price was $32 million. In May 1995 she was delivered and after a minor refit, in which she was fitted with the installations more in demand by her new Asian clientele, such as karaokes, casinos, etc. She begun her first cruise on July 20th as Superstar Gemini from Singapore. She was the first ship of the SuperStar series of Star Cruises, the cruise ship owner of major growth in the last years. This SuperStar series was conceived to attract the international budget market from Asia, Europe and Australia to the Far East. For this reason the SuperStar Gemini was bought, it was the most "European" of the fleet of this shipowner. Eighty percent of her passengers weren't Asian, and came mainly from Australia and Europe, while only twenty percent originated in Asia. In summer 1994, Crown Dynasty sailed in Alaska. She offered seven night cruises, from May 19th to the September 11th. These trips began on Monday in Vancouver on the North bound trip, and from Juneau on the South bound one. The cruise was also sold as a two weeks long package that included a stay and tours in the Canadian Rocky Mountains, or also as a trip combining the two itineraries. Later that year, the Crown Dynasty sailed on 10 nights long cruises between Fort Lauderdale and Acapulco, through the Panama Canal. In 1995, the alliance between Cunard and Crown broke, due to the new EffJohn strategy, centring on the historic Baltic ferry business. Thus, in May 1995, the Crown Dynasty was bare boat chartered to Cunard, who renamed it Cunard Dynasty. The 1995-cruise program was the same as of the previous year, beginning the Alaska season May 18th, and ending on September 10th. The Cunard Dynasty repeated the same schedule in 1996, the only full year that she sailed under Cunard management. Being somewhat ill fitting in the glamorous Cunard fleet, the Crown Dynasty was chartered to a multitude of operators before being snatched away by Fred. Olsen Lines in early 2001. On Novembre1996, Cunard reached a charter agreement with Majesty Cruise Line: the ship would be delivered on March 1st 1997 and renamed Crown Majesty. However, the ship would fulfil the complete 1997 program of Transcanal and Alaska cruises. The last cruise operated directly by Cunard started on May 5th 1997 in Fort Lauderdale, and ended on May 17th at Los Angeles. Here she was delivered to Majesty Cruise Line, sailing to Alaska as Crown Majesty that summer. But again, her career with a new owner was short lived. In February 1997 Norwegian Cruise Line had appeared on the scene and, after overcoming a situation of bankruptcy in the late 1995, had been reactivated by some Norwegian investors. These owners, who had already chartered the cruise ship Leeward to EffJohn International, needed urgently to expand their cruise business. The purchase of existing ships was the fastest way. The purchase of Trafalgar House (the owners of Cunard) in May 1996 by Kvaerner precipitated the events. On March 5th 1997 an agreement was announced between Kvaerner and NCL Holding which included three points. First, NCL Holding purchased the Royal Majesty from Kvaerner for $110 millions in cash, and $80 millions in NCL shares. Second, the transfer of the charter of the Crown Majesty from Cunard to NCL Holding until to end of the contract in 1999, with delivery in the fall of 1997. And third, the construction of a new 2,000 pax cruise ship in Kvaerner Masa Yards, with delivery in June 1999. They were months of frenetic activity, where the ship changed name and hands three times, leaving complete schedules unfulfilled. Thus, the 1997 Cunard brochure repeated for a fourth consecutive year the same timetable for the Cunard Dynasty: two week long transcanal cruises and week long Alaska trips in the summer. This schedule was fulfilled as Crown Majesty, when already she was chartered to NCL Holding! She was renamed Norwegian Dynasty in late September, and again offered in the winter 1997-1998 the same programme: transcanal cruises from Montego Bay to Acapulco. And� of course, after some cruises to and from Hawaii in the summer of 1998, the Norwegian Dynasty was based again in Vancouver, sailing to Alaska. But the delivery of a larger panamax cruise ship to NCL meant that the small Norwegian Dynasty didn't fit well into the fleet so, her charter wasn't renewed and, on March 1st 1999, Commodore Holdings Limited announced the four year bare boat charter of the Norwegian Dynasty, with purchase option and with November 1999 delivery. The same press communication expressed the creation of a new subsiduary, called Crown Cruise Line. The detailed analysis of this advertisement provoked disbelief. The situation was the same that almost ruined EffJohn International four years previously! Commodore Cruise Line was then operating four veteran cruise ships in the budget market, and wanted enter the contemporary market. For this purpose it formed a separate branch and chartered Norwegian Dynasty. Crown Cruise Line planned to use their new ship in two different locations: in summer, she sailed from Philadelphia to Bermuda and, in winter, she sailed from Aruba and New Orleans. She was christened in New Orleans on December 2nd 1999 and sailed on her first cruise from Aruba on December 18th. An agreement with Apple Vacations assured the flight connections and the flow of passengers. The bookings were good and Commodore soon purchased the Crown Majesty from her Scandinavian owners. After her 2000 Bermuda season, the Crown Dynasty sailed back to Aruba for seven nights Caribbean cruises. However, on December 28th 2000, Commodore Holdings Ltd. signed a Chapter 11 and declared bankruptcy. After this initiative, they fired 110 employees, keeping only fifteen people in their offices, and suspended the cruises of their three ships. The principal problem of this ship owner was that their payments to the banks were just too high. The main creditors of the company were Scandinavian banks. The financial problems of Commodore had their origin in a joint venture with Mexican and US interests to operate a gambling cruise ship, Enchanted Sun, between San Diego and Mexico. The cruises begun in April 2000, but were soon suspended in June, with $15 million losses. The fully booked winter season of the Crown Dynasty was cancelled, and she was laid up in Aruba, waiting her sale. On April 2001, it was know that the UK-based Norwegian owned Fred. Olsen Cruises was in the market for a third cruise ship to join its fleet. The Norwegian ship owner said that this was consistent with its plans for international expansion. The announcement came on the heels of their decision to switch its two existing ships from the NIS register to the Bahamas earlier that year. Fred. Olsen Cruises did not reveal at that time the details or price of the new ship or the timing of the purchase but they said it was likely that a second-hand vessel would be chosen. At that time Fred Olsen Cruises operated two ships, the 1966-built, 11,209 gt Black Prince and the 1972-built, 28,668 gt Black Watch. Soon, a ship was found. The long search by Fred Olsen Cruise Lines for a third vessel ended with the GBP 52 million purchase of Crown Dynasty from banks acting as liquidators for Commodore Cruise Lines, then in Chapter 11 bankruptcy in the United States. The Crown Dynasty was laid up after the bankruptcy of her owners, New Commodore Cruise Lines. She meet perfectly the small and intimate ship that Fred. Olsen Lines liked. After a transatlantic voyage, and a first small refit, afloat in Santa Cruz de Tenerife, she was sent to the Blohm + Voss yard in Hamburg. Here, she underwent a comprehensive refit and refurbishment, both on the hotel and technical sides of the vessel, and she emerged almost as a new ship. The internal project had been undertaken under the guidance of the UK design team McNeece, supervised by some members of the Olsen family. McNeece was responsible for the re-design of the pubic areas and selection of furniture, whereas the Olsens were personally involved in selection of fabrics, artworks, sculptures, and colour schemes. The main outfitting contractor carrying out work on the hotel side was Southampton-based International Interiors. In only 47 days, Crown Dynasty became Braemar. Most public rooms were gutted and totally rebuilt, cabins were refurbished using high quality fabrics and carpets, and Mr. Fred. Olsen Sr. personally oversaw the installation of the many works of art during the ship's brief visit to Oslo. A major area of refit work was the conversion of a number of twin bedded cabins for single occupancy, reducing the passenger total to around 750. In early August 2001, Braemar sailed to Dover where she was provisioned and where the crew was given the chance to get accustomed to their new home. After a number of functions, the ship was ready to officially set sail for the first time on August 9th, 2001 on a 2-night pre-inaugural cruise to Antwerp. On August 11th 2001, Fred. Olsen Cruise Lines' new Braemar left Dover on her sold-out maiden voyage to Northern Europe. Later this year, she was switched to Southampton for autumn departures to the Mediterranean. Afterwards she began to cruise in the Caribbean during the winter months. This schedule was repeated year after year, with the vast majority of the passengers multiple repeaters. As I live on Spain, it was difficult (and expensive) to try to visit both the SuperStar Gemini and Walrus in the Far East, so the description of this trio of Spanish built cruise ships is based on the Braemar. When she was built, the Braemar and her sister were small by today's standards, the 730 passengers, seven decks, 20,000 gt Braemar falls almost in the "yacht-like category". When I visited her last time in Barcelona, the Larry Ellison huge mega yacht Rising Sun was in port, and the Braemar looked smaller, mainly in length, when compared with Ellison's boat. But due to her very clever inside design, this ship feels much bigger than she actually is. The ship had a mixed vertical layout (cabin forward and public spaces aft), with a whole deck (number five) devoted to public spaces. The main element used to enlarge her size was the five deck high atrium, located aft on starboard side, aft the funnel casing, with a huge wall of glass providing a stunning view of sea and sky on the Braemar's starboard side. It was one of the few asymmetric atriums afloat, and highlighted a multi-deck high beautiful mural on the forward wall, plenty of sky schemes, and crowned by a skylight. It worked very well as a reference point, with direct access to the Dining room on deck 4, Coral Club on deck five, Palms Café on deck 6 and Skylark Club on deck 7. Some people say that it is a waste of space, but for me appears otherwise as the focal point on board. It was easy to orientate in this small ship, but the atrium makes it impossible to get lost! It was functional, but also elegant, with polished woods, gleaming brass, and gentle lighting. But it wasn't cavernous and glitzy as on some mega ships, and also doesn't feature panoramic lifts, also a common feature found in these spaces. This is also the place where the port and port agent gifts to the ship are displayed, and some Fred. Olsen repeat passengers like a figurehead of an older ship here. Another attractive feature of Braemar was her stairway arrangement. The aft stairs were located on the port side aft corner of the atrium, and were placed at an angle, close to the two lifts. It looked airy, and the steps appeared to be floating inside the huge atrium. It was a true grand staircase, backed by a combination of nautical themed murals and mirrors. The whole effect was very effective and enhanced the spaciousness. The two colour marble floor (like a chessboard), and the marble lift front improved the gracefulness of the space. The forward stair had also an angled layout, but not in a curved form. Both stairs share the same green carpet, with blue musical notes. The corridors between the forward and the aft stairs also had the same carpet. So, almost all circulation areas on board had the same colour scheme, different from other cruise ship where each stair and lift block had its own colour. On deck 5 (Lounge Deck), forward the atrium, was the ship's 24-hour Reception Desk, manned by a charming team. It had the advantage of being on the route between dining room and theatre, but the passengers embark on the lower atrium deck, and this could be also a good location. 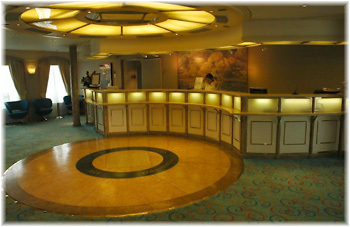 The inlaid circular marble floor directly in front of the reception desk (a form which was also repeated in the ceiling) told passenger that they were in the centre of the ship, while a glass encased scale model of the old cruise ship Queen of Bermuda was a reminder of the time when the ship, as Crown Dynasty, sailed once in the Bermuda run. Close to the Reception Desk, on a starboard corridor, the photo gallery is located. The deck 5 has more headroom than the cabin ones. Furthermore, the designers had played with slopes to improve additionally sightlines. This fact means that there were ramps with a pronounced slope on this deck, for example, in the entrances of the Show room. Braemar is named after the picturesque Scottish highland town that has become the Olsen family's second home. As a tribute to the Scottish culture, all Fred. Olsen cruise liners, Black Prince, Black Watch, the Braemar and now the new Boudicca, have at least one public area that is decorated with the highlands in mind. After the success of the Braemar Room on Black Watch... the Braemar, of course, also had its own Braemar Room. In her Crown Dynasty days, a casino was located in this space, and was the best product of the 2001 refit. The main feature there was the carpeting: green tartan everywhere The Scottish character of this room was emphasised in her floor, a beautiful life-size coat of arms with two pretty redheads of the Scottish Tourist Board pointing at Braemar Castle, superbly placed and lighted, close to the piano. Also nearby a wonderful scale model of the second Braemar was located. The present Braemar is the third vessel to sail as Braemar under the Olsen flag. The former 2nd Braemar was a small ship built in 1953 that sailed between Oslo and Newcastle until the seventies, and was sometime used in cruises. These three elements split the room: aft, all upholstery was blue, but forward a splendid beige was used in sofas and armchairs. The bar was located forward, on the port side, with a green counter. The woodwork on pillars and bulkheads was also very good, as well as the geometric beige ceiling. All the room was lit through large windows fitted with blue curtains. What I especially like about the Braemar Room is the clever arrangement and colour schemes of the furniture; the comfortable but heavy chairs and the varying artwork. The large abstract paintings placed on the forward and aft walls look beautiful, and also give a certain modern and sophisticated atmosphere to this room. The mixture of the diagonal circulation, and a combination of uses, such as piano bar, bar, lounge, and natural meeting point, made this beautiful room my favourite place on board. Forward of the deck 5 (or Lounge Deck) the main show lounge was positioned. 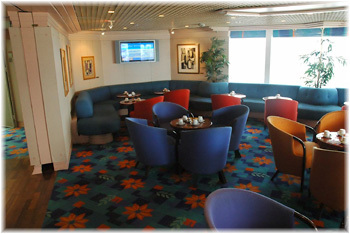 The Neptune Lounge is a special show lounge: to improve sightlines, it was oriented starboard to port, with an 90 degree twist. 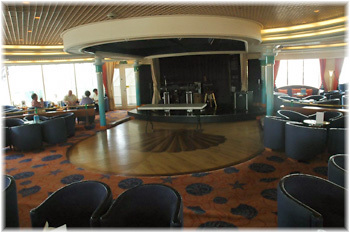 Some designers created mainly secondary lounges (found in the larger Princess and Carnival cruise ships) with a diagonal lay out but contrary to most other shipboard showrooms, the Neptune's Lounge stage is not placed at either the forward or aft part of the room, but was itself set along the port side, with an orchestra area located forward of the stage. This room was a semicircular lay out, but there were many seats with a peripheral view. There were fixed rows of seats around the stage, with a lot of moveable seats between them and small circular tables, which usually cause problems for people passing through and for the staff serving drinks. But this lay out had a great advantage: the stage was closer to all the seats, and this fact encouraged interaction between entertainers and audience. There wasn't a bar here so all service came from the nearby Braemar Room, with a long run for the stewards, mainly in the forward seats. 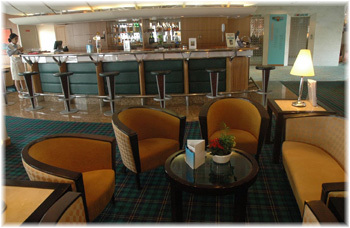 The Neptune Lounge is also the location for the Captain's Cocktail Party and serves as the ship's main entertainment venue. This room was done in an attractive colour scheme: the carpet, and some rows of seats were terracotta, whereas the rest of the seating and the ceiling were soft yellow, as well as the stairs. The brass lights for the sofas were a splendid nautical touch. So, this room had a fresh, unconventional feel, far from the huge theatres found in megaships. 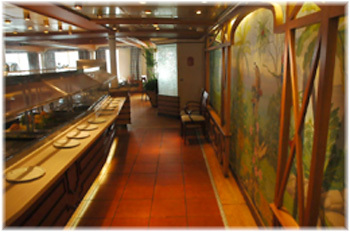 Between the Photo Gallery and the Braemar Room there was a diagonal corridor which housed several counters, such as shore excursion, direct cruise sales, shop and boutiques, etc. The green tartan carpet was the same found on Braemar Room, and furniture was mainly light wood or green. 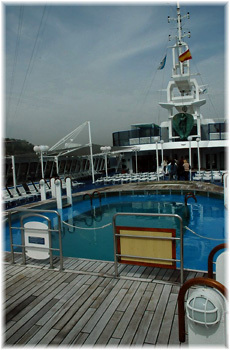 Aft the atrium, also on deck 5, the Coral Club was located. One of the wonderful features of Braemar is the large number of public rooms for a ship of this size, some of them with dual purpose. So, the Coral Club serves as Braemar's secondary show lounge (with 170 seats of capacity), is fitted with a good sized wood dance floor and an inviting bar, and also a casino, in a tiny space on port side. This room was also the venue for afternoon tea. This bright room has windows on three sides, provides access to the aft open decks, and was decorated with a splendid seashell design orange carpeting, offset beautifully by the blue chairs and orange-and-blue sofas. The dance floor had a shell and the bar, of semicircular shape, had a brown counter with lots of brass details. The green pillars complete the marine atmosphere that McNeece tried to give this room, another example of good taste. Aft on deck 7 the Braemar's nightclub. Called Skylark Club was located. This spacious, airy room had a picture window on three sides, and again was dominated by the contrast between the carpeting and the seating areas. The decoration of the walls were plain (only TV screens, plants and curtains), but its loud carpeting, blue with red and green flowers, and a parquet dance floor close to the large bar forward, made also in wood and blue granite, dominates the space. The seating was again multi-coloured (blue, red and terracotta), and the contrast was beautiful. Also, this room had a dual purpose: at night, the passenger could dance with the latest disco songs. But during the day, the Skylark Club is a quiet place, ideal to read a book. At both times, the passengers could directly access the wonderful teak aft decks, to take a breath of fresh sea air outside. This place had a notable problem: her small headroom. Forward of the Skylark Club, across the atrium, the small Library was located. This space was the truly Old English space on board, with books galore, framed prints, big chairs, clear brown carpeting and wood panelling all around. Still, it is a pity Braemar does not offer a spacious, window-walled library, reading- and card room like her fleet mate Black Watch. If the Skylark Club will be used (even partially) as an extension of the Library, as a true Library and Reading Room, or part as a Game room, the whole deck 7 public rooms would work better. Also, the small Internet Café located on upper decks forward would be better located here. 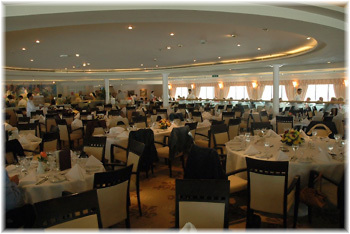 The Braemar main dining room was the aft located Thistle Restaurant. The 380 seat two sitting dining room had a beautiful tiled entrance directly from the lowest level of the atrium. The dining room, as all other spaces aft, had windows on three sides. It had a light and airy look due mainly to the natural light and beige colour scheme, which works very well. 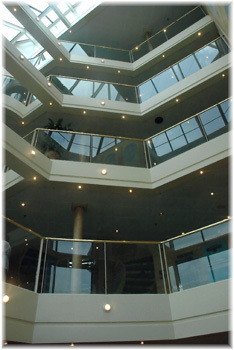 It had a clear influence from the Star Princess, now the Ocean Village. The dining room had additional headroom due to the deck above (number 5) being raised in the aft section. I think it's easy to achieve dramatic effects in huge spaces, but only the better designers were able to obtain these results in more confined spaces. Yran & Storbraaten hit the design of this dining room, with all its physical constraints, and the results were magnificent. The carpet selection was the key: the beige improves the lightness of the room, and was complemented by beige curtains, mainly beige ceilings, beige chair upholstery and beige stripes in bulkheads. Another good design detail was that the central section was raised, and so the passengers sitted here can enjoy sea views. The Etchell glass handrail between these two sections was another key feature of the dining room design. But the ceiling in this central section was very plain, and some kind of painting would be a good addition. Again, another good detail (this time coming from McNeece) was the thistle motifs in both carpeting and on the glass dividers, and skylight aft. Tables were set mainly for group from 6 to 10, but there were also for two. The lay out was spacious, and seating very comfortable. There were two buffet lines forward for informal meals, but dinner in the Thistle Restaurant was decidedly very formal. The acoustics of this place were excellent due to the phonic roof installed in the last refit. Her historic problem, severe vibration in the aft end, in spite of the great number of pillars, was also corrected with the installation of a "duck tail" round her propellers. The informal Palms Café was located also in the aft end of the Braemar, but close to the open places, two decks above the Thistle Restaurant. It was another surprise: it was one of the most attractive casual buffets afloat and was decorated with a tropical flavour. This motif was clear in its specially commissioned murals located forward, close to the buffet line, which gave this place a sunny, tropical feel. A lot of natural light enters through large windows on both sides and a glass wall aft, fitted with automatic doors that lead out to open teak deck where more tables were set up at breakfast and lunch time, close the open-air Lido Bar. The only problem: the low headroom. Other key features were the polished dark wooden floor, the wood ceiling and some palm trees, which also give her a colonial look. The blue tones of the curtains and chair upholstery complete the decoration. All chairs were wood made, and all tables were set with white linen and real china and cutlery�never a plastic tray on a Fred. Olsen ship! It was an interesting fact that the same meals were served in both dining rooms (formal and casual). This was the perfect way to avoid crowding in the buffet in daytime, and in the formal dining room at dinner. Midnight buffet was also offered every night here. Braemar's original designers had come up with a wonderful aft deck arrangement. With teak wooden terraces running down, a natural amphitheatre is formed which is the perfect stage for sunbathing and for outdoor meals and drinks. This arrangement, reminiscent of the older liners, was later found in larger cruise ships mainly dedicated to the British market, such as the Oriana and Aurora, but also in American marketed ships, like the Crystal trio. 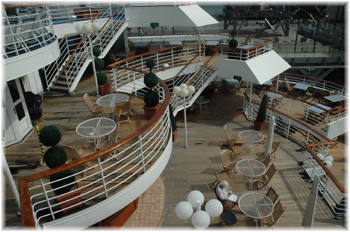 In these aft outdoor decks, all furniture was made of wood, with glass tables. Another exotic figurehead and a small ornamental pool were placed on the lowest deck of the amphitheatre, overlooking the wake of the ship. Again, as on former liners, a true wrap-around deck, mainly covered with fake teak-look rubber material, was found on deck 5. The wide promenade deck was another Fred. Olsen highlight: all the ships of his fleet (except the tiny Black Prince) were fitted with this delightful feature, which was a popular hangout for many passengers. The main outdoor places were found on Deck 8 (or Marquee Deck). Because of weight restrictions, this deck had a blue plastic covering, with only some small areas, such as the forward stage and the pool perimeter, decked in teak. Sheltered from the wind by glass walls and from the sun by plastic canvas, this is a wonderful place to enjoy the sun, but it was a bit crowned mainly in full sailing days. The pool was of decent size, with two Jacuzzis and a small padding pool, all heated. Located aft of the pool, under the funnel, was the inviting Pool Bar, with a polished wood counter, and the same furniture found on the aft amphitheatre decks. All lounge chairs and tables on this open deck were plastic made without padding, except the bar ones. Another Fred. Olsen figurehead looms over the pool deck from deck 9, where there was another sun deck overlooking the bow of the ship. On the forward end on deck 8, with splendid bow views through a slope bulkhead, was the Fitness Centre. A small beauty salon and hairdresser run by Steiner's located port side was complemented by a spacious red decked, mirror walled aerobics room forward, which was under an oval skylight, completed by a few weight and health machines starboard. This side also houses the sauna and treatment rooms. A small Internet Café (only four flat screen pc's) was situated to starboard side. The Braemar 406 passenger cabins were all well appointed, with nice new carpets, but were a little smaller than the industry standard. An extensive use of mirrors, soft furnishings and discreet lighting tried to make it appear larger, and the effect was sometimes disappointing. A very high proportion of her cabins had sea views. Fred. 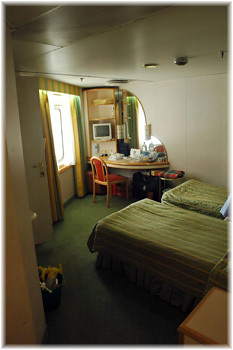 Olsen offered no less than 16 cabin categories on board Braemar, in order to provide the perfect accommodation for everyone. The cabin lay out was essentially the same designed by Norwegian firm Yran & Storbraaten, but some double cabins become singles, and as consequence, overall capacity was lowered after 2001 refit. The cabin deck corridors shared the same carpets as the stairs, and had a lot of wood in form of hand rails, portraits, etc. The lower grade were the standard cabins (with a surface of approx. 14 square meters), which featured a comfortable look, with all the standard amenities like a hairdryer, an attractive toiletries pack in the bathroom, a good shower (with room for two) and plenty of hanging space, but minimal drawer space. There is room under the beds for all the luggage. The beds were fitted with continental-style duvets. The inside standard cabin shared the same amenities, except the two portholes. Bathrobes are not provided in the lower grade cabins. The Cat. A superior outside cabins, some of which have obstructed views, offered a little more space and a refrigerator. The most luxurious cabins, called suites, were found on the Bridge Deck. Braemar has three types of suites, each with its own balcony and all named after world cities. The superior suite had a surface of approx. 28 square meters, the balcony suites were approx. 20 square meters, and the De luxe suite was also approx. 20 square meters, and all had bedroom with balcony, bathroom with shower, hairdryer, television, hi-fi, VCR, refrigerator and safe. To match the suite names, the ship's designers have also given each suite a unique look, with artifacts, colours and fabrics to match the namegiving city. There is also a very limited room service menu which is not available 24 hours a day or on the days of embarkation or dis-embarkation. Bed coverings are by means of duvets. One very positive aspect is that Fred. Olsen offers no less than 4 categories of dedicated and spacious single cabins. Fred Olsen Lines: A Different Approach to Offer Cruises The small ship concept of cruises of Fred. Olsen Lines has been growing spectacularly in latest years. Every five year, a new ship was added to the fleet: 1996 Black Watch, 2001 Braemar and 2006 Boudicca. The most modern of the fleet is the Braemar, and also one of the smaller. Her intimate dimensions and her shallow draft means that she can access small ports, where huge cruise ship cannot. But also this size makes them more vulnerable to the sea forces and is better suited to Caribbean and other good weather seas than for the transatlantic positioning trips. The intriguing cruise itineraries were another value of Fred. Olsen. 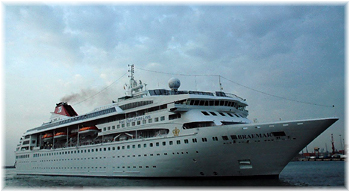 Braemar visits the Amazon, small Caribbean islands, etc. Also, this small ship policy means than most passengers seemed to know each other and most of the crew, and a seagoing "homelike" atmosphere was felt on board. The passengers act sometimes as a family, in a family-owned cruise ship. I think that smaller cruise ships are also more friendly. You get less choice of public rooms, but how many do you need anyway? Some people spent their entire cruise walking kilometres of corridors, or, waiting endlessly for lifts. Ships like Braemar are more friendly, and also have better connection with the sea through promenade and outdoor decks. Another Fred. Olsen secret was the Braemar's multi-national 320 crew. With most service crew hailing from the Philippines, with Norwegian senior officers and European staff, many had sailed with the company for many years. A rarity found on board was that all dining room staff were male, and a mostly female bar and reception staff. The cruise experience was quintessentially British, very different from what one experiences aboard other American oriented cruise lines. All cruise staff members being British, entertainment on board is very much geared to British tastes. As compared with megaships, entertainment was rather low-key, but always tasteful. With its beautiful and comfortable public rooms, her moderate size and personal service from her staff, Braemar combines the best Fred. Olsen traditions in a relaxing, comfortable, contemporary environment.